미국 전역에서 지역회로 전국 연합회를 섬기다가 임원 수련회로 함께 하는 기쁨과 감사 속에서 즐거운 만남의 시간을 가지게 되었습니다. 예배와 찬양, 워크숍을 통하여 우리의 신앙을 점검하며 지나간 한해를 돌아보며 내일을 준비하는 은혜의 모임을 주님께서 허락해 주셨습니다. 무엇보다도 모든 게 하나님의 사랑이요 은혜임을 또다시 알게 되었습니다. 부족한 저희가 한인 여선교회 전국 연합회를 통하여 주님을 섬길 수 있어서 너무나 감사했습니다. 주어졌던 시간을 숙고하며 내일을 계획할 수 있도록 우리를 인도해 주시는 하나님께 모든 영광을 드립니다. 어려운 현실에 집착하지 않고 주님께 초점을 맞추어 다가올 우리의 미래를 위하여 열심히 토론하며 다음을 계획했습니다. “행동하는 기독교”라는 책으로 우리는 뜨거운 의견들을 나누었고, 우리가 알고 배운 것들을 실천할 수 있는 아이디어를 고심하며 발표하였습니다. 우선 유익한 책을 추천해 주신 총무님께 감사를 드립니다. 책의 제목 자체가 부담이 가기는 했지만 동시에 생동감을 주었습니다. 사실 이 책에서 언급된 모든 것들은 이 세상을 살아가는 그리스도인으로서 평범한 삶 속에서 겪어가는 이슈 내지는 우리 삶의 모습입니다. 말씀대로 살아가지 못하는 모순 속에서 실망하고 때론 비참한 자신들을 발견하지만, 주님의 은혜로 우리는 담대히 십자가 앞으로 나아가 그분의 도우심을 간구하며 믿음의 생활을 시작합니다. 이 책을 읽어 갈수록 심령의 상처가 부풀어 올라옴을 느끼게 되었는데 갑자기 UMW가 내 머리와 가슴을 치고 올라왔습니다. 놀랍게도 이 책에서 다루고 있는 많은 공적 영역에 이미 우리 연합 감리교 여선교회가 함께 하고 있음을 깨닫게 되었습니다. 그리고 더 감사한 것은 지극히 작은 정점에 불과하지만, 연합감리교 여선교회의 회원인 우리를 발견하게 된 것입니다. 감동과 도전의 선상에서 이 구호가 우리의 소망이 되기를 간구하며, 한인 여선교회 모든 회원을 주님께 올려 드렸습니다. 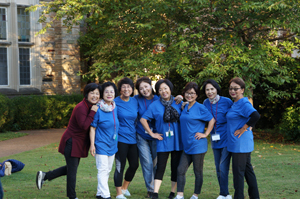 It was a joyful and grateful time at the retreat, serving the National Network of Korean United Methodist Women. 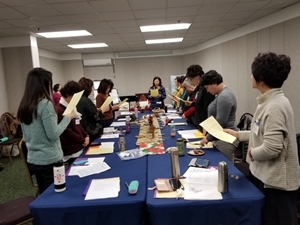 During various workshops and our time of praise and worship, we examined our faith as we looked back at the past year and planned for the future in God’s grace. Above all, I learned again that everything is grounded on the love and grace of God. I am so grateful for the opportunity to serve God through NNKUMW. I give all glory to God for our time together and allowing us to plan for the future. As we gathered together with the theme of “Same mind, same passion, same vision… for missions!”, we focused on God’s plan for the future instead of centering on our current difficult realities. 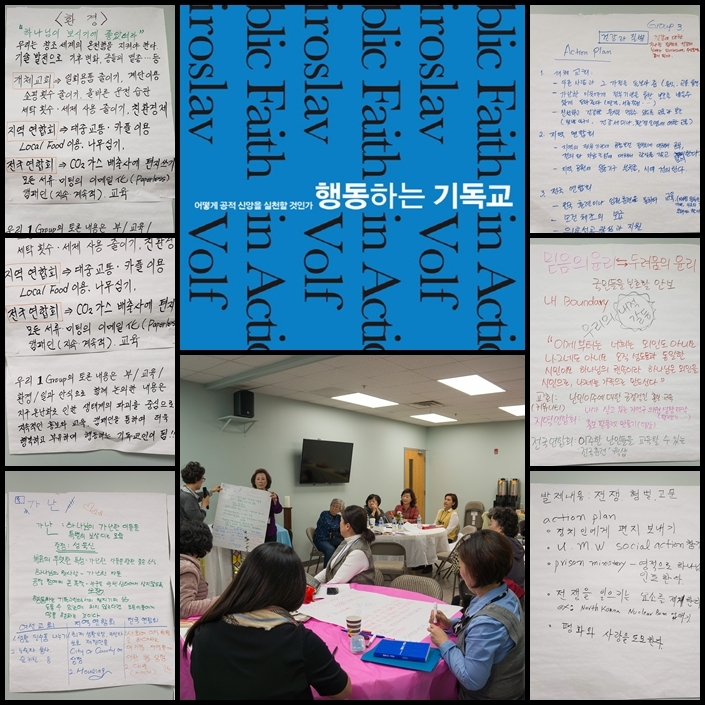 After reading the book “Public Faith in Action”, we carefully constructed an action plan based on what we learned throughout the retreat and shared with the group. I would like to thank our Executive Director, Myungrae Kim for recommending this book. The title of the book was burdensome, but at the same time it gave me a new vision. All the topics mentioned in this book are normal issues that we face as Christians. I am disappointed at how we often live our lives in contradiction to God’s Word, but with the grace of God, we can boldly go forth to the cross and pray for God’s help to begin a life of faith. As I read this book, I felt my spiritual wounds resurfaced and suddenly UMW came to mind. I realized that the NNKUMW is already present in many of these public spheres already. On top of all, I am grateful for being a member of the NNKUMW which is not a small honor in participating in God’s plans. It is my hope that this slogan becomes the vision of all the members of NNKUMW as I lift up every member to the Lord in prayers. 평화와 사랑의 주님의 이름으로 인사를 드립니다. 작년 한해도 한인여선교회 회원들의 기도와 물질적 협조로 한인여선교회 전국연합회의 사역을 잘할수 있었습니다. 수고해 주신 회원들이 감사를 드립니다. 2018년에는 국내에선 교도소 문서선교와 DC세미나를 실시하였습니다. 교도소 문서선교는 미국내 희스패닉 재소자들를 위한 신앙집을 발행하였습니다. DC세미나에선 연합감리교회의 사회정의 사역에 대해서 공부했으며, 미국의 이민자문제와 한국의 평화통일을 위해 Korean-American들이 무엇을 해야 하는지를 배웠습니다. 탐방으로 참가자들이 본인의 지역구 국회의원들을 만나 미국의 이민자 문제와 한번도 이슈들에 대해서 건의를 하였습니다. 또한 여성 참정권 박물관에 가서 미국 여성들이 법적으로 투표 할 수 있도록 헌신과 희생한 여성들의 역사를 배우는 기회도 가졌습니다. 특별히 UMW 150주년 Assembly가 오하이오 콜롬버스에서 열렸는데 뉴욕 한인여선교회 연합회 회원들이 소고춤으로 축하공연을 했습니다. 또한 1884년에 조선 여성들의 복음사역과 교육을 위해서 $88을 지정헌금을 한 Mrs. Lucindy Baldwin의 묘지와 교회를 방문하여 감사의 예배를 드렸습니다. 선교지 방문으로 4월에는 볼티모아에 있는 박여선 묘지 (한국 최초의 여의사 박에스더 남편)에 가서 100년만에 묘지를 다시 세우는 제막식에 참석하여 특별찬양으로 예배를 드렸습니다. 국외에서 몽골 기독여성훈련을 울람바토우에서 , 중앙아시아 기독여성훈련은 키르키스탄의 비쉬켙에서, 유라시아 기독여성훈련은 하바로브스크에서 실시하였습니다. 참가자들은 모두 UMC 여선교회 회원들로서 함께 배우고, 나누며, 성장하는 시간을 가졌습니다. 2019년 올해는 "같은 마음, 같은 열정, 같은 비전... 선교를 위하여! "하는 표어아래 국내와 국외에서 사역을 할 예정입니다. 한인여선교 회원들의 기도와 물질적인 협조를 부탁드립니다. 여성과 어린이와 청소년을 위한 사역에 참여하시는 우리 KUMW 회원들은 모두 국내선교사들 이십니다. 감사합니다. I greet you in the name of our Lord, Jesus Christ. With the support of your prayers and financial support, NNKUMW has been able to carry out the ministries well. We deeply appreciate your generous commitment. In 2018, domestically NNKUMW implemented prison ministry by supplying books while also holding our seminar in DC. We published faith-inspiring books for the Hispanic inmates within U.S. prisons. 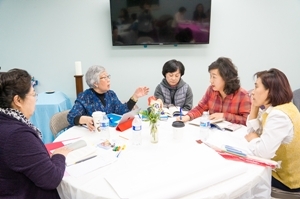 In DC, NNKUMW learned about social justice of UMC, and they learned about how Korean-Americans implement the issue of immigration and peace for Korean peninsula. As for the field trip, the participants raised issues on immigration and Korea peninsula to the representatives of each respective districts. They also visited museum and learned about women’s suffrage and the women who sacrificed their lives to receive the rights of legal vote. UMW celebrated the 150th anniversary in Columbus, Ohio. NY KUMW Network participated in the celebration with dance and drums. Also, they visited the cemetery of Lucindy Baldwin, who had contributed $ 88 dollars for the evangelism and education of Korean women back in 1884. They held a special memorial service at her home church. 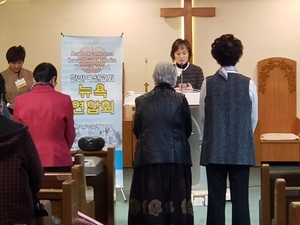 As part of a program of visiting commemorative sites in April, they took part in the rebuilding of the one-hundred-year-old tomb of Yu Sun Park (spouse of Korea’s first female Western style physician, Esther Park) by singing special praise as a group. 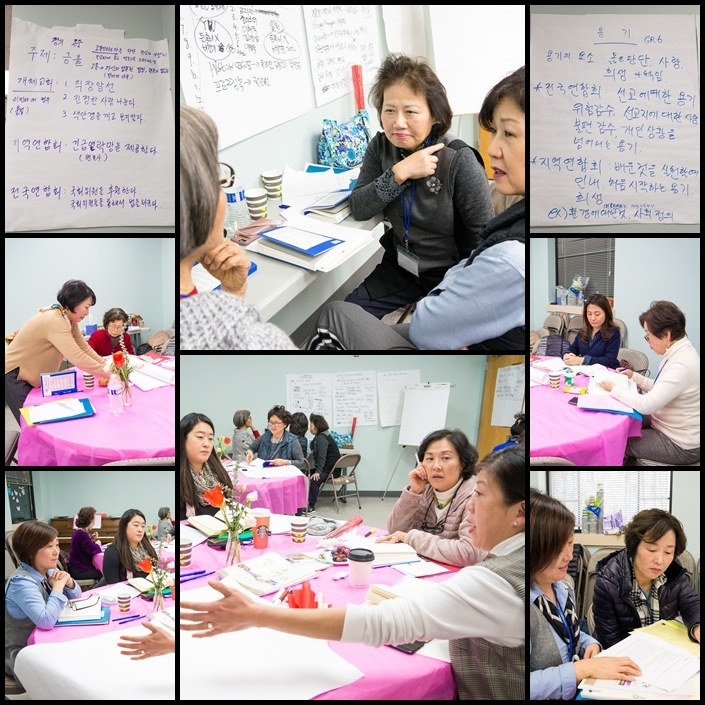 Internationally, NNKUMW held various training programs for the Mongolian Christian Women in Ulaanbaatar, Kirgizstan Christian Women in Bishkek and Eurasian Christian Women in Khabarovsk. All of these UMC Christian Women members learned, shared and grew in Christ with us. 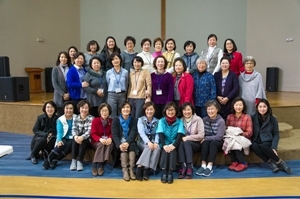 We will carry out our tasks both domestically and internationally under our new slogan for the year 2019: “one mind, one passion, and one vision,…for mission!” We ask for the prayers and financial support from Korean United Methodist Christian women members because as we participate, we are all missionaries at heart for the ministry to the women, children and youth around the world. Thank you so much! 최근 저는 11월 30 일부터 12월 1일까지 뉴욕주 엘렌 빌의 Honor's Heaven 리조트에서 뉴욕연합회 임원 및 회원들과 함께 임원수련회에 참여할 기회가 있었습니다. 제가 참여하도록 요청받았을 때, 가장 먼저 생각한 것은 "수련회"라는 단어였고, 스트레스가 많은 일상생활에서 벗어나 바쁜 일상에서 수련회에 참여한다는 생각에 좋았습니다. 그래서 저는 임원 수련회에 관해 그 이상 알지 못한 채 여행 가방을 꾸렸습니다. (매년말에 있는 임원수련회에 현재 임원이 아닌 회원들 몇 명을 초대하기 때문) 그러나 병 속에 담아가고 싶도록 청명하고 깨끗한 공기가 있는 Catskill 마운틴에 도착했을 때 그 위치와 아름다움이 기대했던 것 이상이었습니다. 퀸즈, 스태튼 아일랜드, 포킵시, 롱 아일랜드 및 뉴욕시 지역의 다른 교회에서 총 15명의 여성들이 차례로 도착하여 서로 인사했을 때 즐거움과 영적인 주말을 앞두고 흥분감이 있었습니다. 금요일 첫날은 환영과 찬양으로 시작되어 성경 공부, 맛있는 저녁 식사 및 2019년을 준비하는 회의가 있었습니다. 밤 9시에 프로그램을 마친 후에 우리는 크리스마스 파티에 참석할 준비가 되었습니다! 저는 이 그룹이 놀 줄도 알고 기도하는 법을 알고 있다고 말하고 싶습니다 !! 다음 날 아침 또 다른 맛있는 식사를 시작으로 찬양, 아침 예배, UMC의 미래에 영향을 미치는 현재의 사회 문제와 관련된 이슈에 대한 진지한 토론, 팔레스타인 평화 문제 등이 논의되었습니다. 저는 제가 할 수 없는 무력 함을 느꼈지만, 동시에 하나님은 인간의 연약함을 돌보고 평화로운 길로 인도하실 것을 알았습니다. 그 심각한 토론 이후, 우리는 약간의 휴식을 가지려고 신선한 Catskill 산의 공기를 마시기 위해 밖으로 나갔습니다. 그리고 이 주말을 기억하기 위해 사진을 찍으며 친교를 나누었습니다. 휴식 후, 우리는 흥미 있는 그룹 활동을 가졌습니다. 게임과 비슷한 것을 했는데 그 게임의 끝은 "우리 인생에서 가장 중요한 것이 무엇인지"생각하게 했습니다. 몇몇 분들은 하나님과의 동행 또는 신앙생활이 삶에서 가장 중요한 것이라고 대답했습니다. 우리의 마음과 영혼을 반성하고 재구성하는데 충분한 시간을 보내고 마침내 마지막 활동인 공예 시간에 우리는 한국의 매듭을 만들었습니다. 저는 제가 사용할 수 있고 다른 이들을 가르칠 수 있는 공예품을 만들 수 있었기 때문에 이 활동이 특히 좋았습니다. 그날 오후에 우리는 웨슬레의 전통적 언약 기도문을 낭독하며 폐회 예배를 드리고 수련회 프로그램을 마쳤습니다. 마지막으로, 이번 수련회는 매우 잘 계획되고 준비된 수련회였습니다. 저는 수련회에 참여할 수 있는 기회를 준 뉴욕연합회에 감사의 말씀을 전합니다. 그리고 무엇보다도 여선교회 사역을 계속해서 발전시키는데 시간과 헌신을 하며 열심히 일하는 임원들에게 감사의 말씀을 전하고 싶습니다. 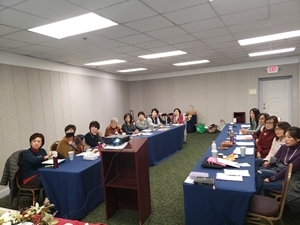 Recently I had the opportunity to participate in the Korean Conference UMW Network annual retreat with KUMW executives and members at the Heaven’s Resort in Ellenville, NY from November 30th through December 1th. When I was asked to participate, the first thing came to my mind was the word “retreat” and I liked the idea of retreating from daily, busy, if not stressful, life. So, I packed my suitcase not knowing much beyond that about the Korean Conference UMW Network retreat. When I got there, however, it was better than I expected in terms of the beauty of the location and its setting – the Catskill Mountains, with crisp, clean air that you want to package in a bottle. 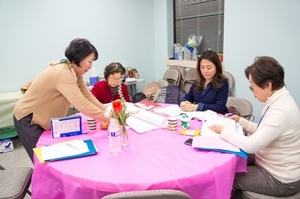 One by one, the participants arrived until we reached a total of fifteen women from different churches in the New York area - some from Queens, Staten Island, Poughkeepsie, Long Island and New York City. There was a definitely sense of excitement as we greeted each other in anticipation of the fun & spiritual weekend ahead. The first day on Friday started out with welcome & praise, followed by a bible study, a delicious dinner, and the annual meeting for the 2019. After everyone completed the programs at 9 PM, we were ready for the Christmas party! I have to say this group of ladies knows how to play and pray! The next morning started out with another delicious meal, followed by praise, morning service, some serious discussions of the issues related to the current social issues affecting the future of UMC, the issue of Palestinian peace. I must say I felt helpless that I could not do much, but at the same time I knew that God will look after the human weaknesses and lead us in His peaceful way. After those serious discussions, we welcomed some break time. We went outside to catch some fresh Catskill Mountain air, and we also took some photos to remember the weekend. 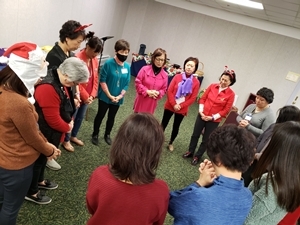 After the break, we had an interesting group activity; played like a game, its ending required us to think “what is the most important thing in your life?” Several ladies answered that their walk with God or their life in faith was the most important thing in their lives. After the long hours of reflecting and reshaping our minds and souls, we finally reached the end of the final activity, Craft time, where we made Korean Mae-Deup! I especially loved this activity because I was able to produce my own craft that I could use and to teach others. 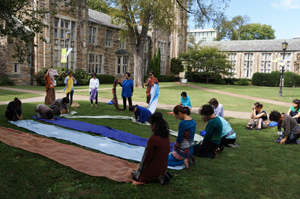 Later that afternoon, we completed the retreat program with a closing service by reciting the Wesleyan’s traditional covenant prayer. Overall, this was a very well-planned and well organized retreat. 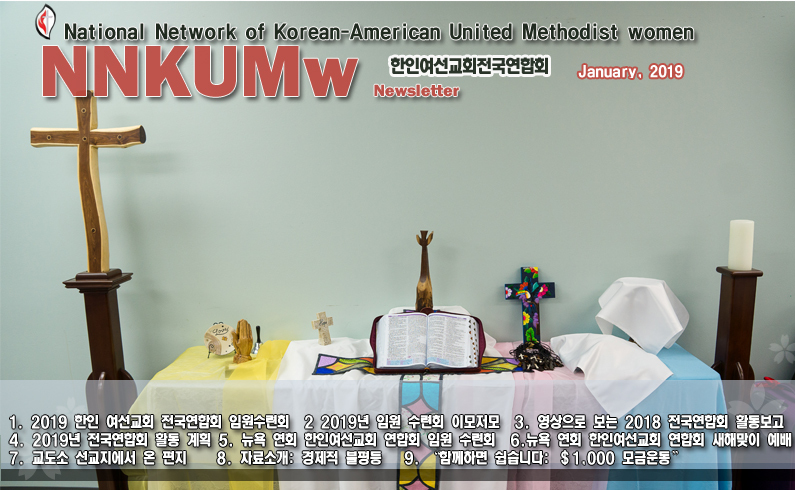 I would like to thank Korean Conference UMW Network for the opportunity to be a part of the retreat, and most of all, I thank all of KUMW’s hardworking members for their time and dedication in continuing to advance the cause of Korean Conference UMW Network. 뉴욕여선교회 연합회의 “새해맞이 예배 및 내적치유 세미나”가 1월 19일 토요일 퀸즈중앙감리교회에서 12개 교회의 50여명의 회원들이 모인 가운데 열렸습니다. 새해를 맞이하면서 또 한 해를 열어가시는 하나님의 은혜를 감사하며, 서로 떨어져서 오랫동안 못 만났던 친구들을 만나는 설레임과 세미나에 대한 기대로 마음이 부풀어 있었습니다. 아침 10시 감사예배로 시작된 하루의 일정은 세미나와 뉴욕연합회의 정기총회 그리고 만들기 시간으로 한지로 복주머니 만들기 강습이 있었습니다. 콜로라도주 덴버의 아담스 카운티에서 교도소 사역을 하시는 이영희 목사님은 아담한 체격에 조용하시며 단발머리에 수수한 옷차림이셨습니다. 세시간 반 동안의 내적치유 세미나의 주제는 “고통의 방(Torment Room)-우울증”과 “축복의 방-승리의 기도”이었습니다. 오전 시간 “고통의 방”시간에서는 우리에게 어떻게 하나님과 친밀한 관계를 갖고 고통의 방에서 나와 어떻게 주님을 사랑하며 잘 섬길 수 있을지를 말씀해 주셨습니다. 우선 고통이란 단어가 내 마음을 무겁게 했는데 내가 생각한 교도소 사역은 이 세상에서 못된 짓을 한 사람들이 모인 곳이기에 철망을 사이에 놓고 신앙 서적을 전하고 기도하고 오는 것으로만 생각했었습니다. 성경 말씀 이사야 55:1-9, 요한복음 10: 27-29의 본문을 통하여 하나님의 긍휼하심과 주님의 음성을 듣기를 원하신다고 하셨습니다. 상심한 마음(Trauma)에서 해방되려면 누가복음 4:18-19 말씀처럼 (주의 성령이 내게 임하셨으니..)자신을 용서하고 나에게 해를 가한 당신을 용서하고 또 모든 사람을 용서할 때에 진정한 자유와 해방이 될 것입니다. 이영희 목사님은 채플린으로써 일주일에 거의 40시간을 교도소 안에서 복역하고 있는 재소자들과 함께 지내면서 주님의 말씀을 담대하게 전하십니다. 한국인 재소자나 영어권 재소자들에게 마음의 상처를 만져줄 수 있는 마음으로 다가서며, 눈과 눈을 마주 보고 성령의 도우심을 구하십니다. 저들과의 진정한 대화가 가능하기까지 두려움 없이, 미소지으며 아픈 상처를 주님의 말씀으로 감싸시고, 고통의 방에서 빠져나올 수 있도록 인도하시고 계심을 알았습니다. 비록 재소자들이라도 주님을 영접하고 주님의 십자가의 고통과 피흘림을 같이 느끼며 깨달아 알고 거듭난 영혼이 되어가고 있다는 간증을 들으면서 나는 가슴이 조여오는 순간도 있었습니다. 민수기 6:24-26 “여호와는 네게 복 주시고 너를 지키시기를 원하며 여호와는 그의 얼굴을 네게 비추사 은혜 베푸시기를 원하며 여호와는 그 얼굴을 네게로 향하여드사 평강 주시기를 원하노라 할지니라 하라” 이 말씀으로 내 사랑하는 자녀들을 기도로써 하나님의 길로 인도하며 사는 모두가 되기를 소원하였습니다. 하나님께 아들을 바치기로 서원하는 한나의 기도(사무엘 상)를 통해서는 주님은 나의 기대를 내려놓는 것까지 가르쳐 주신다는 것과 다니엘의 기도(다니엘 9:1-23)를 통해서 내가 회개할 것이 무엇인지를 먼저 깨달음으로 하나님과의 기도도 문이 열릴 수 있다는 확신을 주셨습니다. 하나님께는 긍휼과 용서하심이 있으므로 진정한 회개는 하나님의 마음을 움직이는 능력이 있는 것 같습니다. 내가 가진 은사와 시간도 다 하나님이 주신 것이므로 이 모든 것을 사용함에 있어 즐거운 마음으로 다시 돌려드릴 수 있어야 하고 우리의 삶 속에 하나님과 가까이하는 기쁨과 섬기는 것에 대한 기쁨을 찾고 감사하고 예배하는 것을 배울 때 인격이 변화된다고 하셨습니다. 우울증(영적 침체)은 하나님과의 관계가 단절 될 때 생길 수 있는 나의 문제인 것 같습니다. 우울증으로부터 어떻게 벗어날까? 치료는 어떻게 할까? 에 초점을 두고 강의를 듣다 보니 무엇보다도 내 깊은 곳에 다른 무엇이 있어서 삶의 실패감이나 삶의 무의미함을 자꾸 생각나게 한다는 것도 다시 깨닫게 됩니다. 그러니 진정한 회개로 예수그리스도가 통로가 되어야 영적 침체가 변하여 감사와 사랑과 기쁨과 섬김의 기도가 시작되는 것입니다. 하나님께 더욱 감사하고 진정으로 예배하는 것을 배울 때 인격이 변화되고 하나님을 사랑하고 하나님께 가까이 가는 것에 대한 기쁨과 하나님 섬기는 것에 대한 기쁨을 찾게 되리라 믿습니다. 2)주님, 나를, 당신도, 다른 사람도 고통의 방에서 나와서 축복의 방으로 인도하소서. 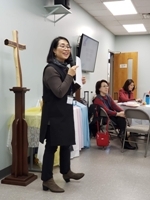 The "New Year's Worship and Inner Healing Seminar" of the New York KUMW Network was held Saturday, Jan. 19, at the Queens Central Methodist Church, with more than 50 members from 12 churches. I was grateful for the grace of God. God opened another year as I entered the New Year, and I was filled with the expectation and excitement of holding seminars and meeting friends whom I had not met for a long time. The day's schedule began with a 10:00 am thanksgiving service, and the schedule included a seminar, a regular general meeting of the NY KUMW Network, and a traditional pouch making class during craft time. Rev. Young Hee MacDonald, who serves a prison ministry in Adams County, Denver, Colorado, was quiet, modest in physique, had bobbed hair and dressed in modest dress. The topics of the three and a half hour seminar on healing were "Torment Room - Depression" and "Blessing Room - Victory Prayer". In the morning, during the "The Torment Room" time, she told us how to have an intimate relationship with God and how to love and serve the Lord. First, the word ‘Torment’ has made my heart heavy. I thought the prison was a place where people who did something wrong in this world gathered, so the prison ministry would consist of having prayers and giving religious books while the barbed wire was present between the prisoners and ministers. As it is in the book of Isaiah 55: 1-9 and John 10: 27-29, God wants us to hear His mercy and His voice. To be liberated from the broken trauma, she said that as Luke 4: 18-19 (The Spirit of the Lord is on me) says, when we forgive ourselves and forgive others, there will be a real freedom and liberation. Rev. Young Hee MacDonald boldly speaks the Word of God by living with the inmates and serving in the prison for nearly 40 hours a week as chaplain. 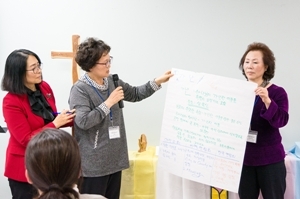 She approaches the Korean inmates and English-speaking prisoners with a heart that can touch their wounds and seeks help from the Holy Spirit. God was leading her until a real conversation with them was possible with a smile, touch the sick with His Word, and help them escape from the “Torment” room. 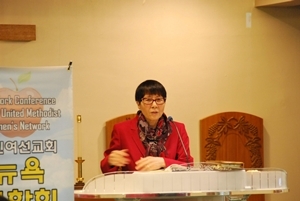 Pastor Lee said that even the inmates are receiving the Lord and feeling the pain and bloodshed of the Lord's cross, and becoming regenerated souls. As I listened to the pastor's testimony, I had a moment of inspiration in my heart. As Numbers 6: 24-26 says "The Lord bless you and keep you; the Lord make his face shine upon you and be gracious to you; the Lord turn his face toward you and give you peace", I hoped everyone to live in this way to lead their beloved children into the path of God through prayer. The theme of the afternoon session was "Room of Blessing and Prayer of Victory." During this time, through Hannah's prayer (1 Samuel), who vowed to give her son to God, Pastor Lee showed that Lord would teach us to lay down our expectations. Also through Daniel's prayer (Daniel 9: 1-23), we were convinced that prayer with God could be opened by realizing what we should repent. Because God has mercy and forgiveness, true repentance seems to have the power to move God's heart. Pastor Lee also said that God has given us all the gifts and time that we have, so we should be able to give it back with joy in using all of these things. 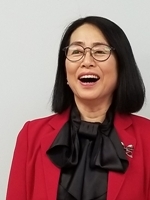 She said that personality changes when we learn to find joy in our lives, joy near to God, and joy in serving and worshipping God with thanksgiving. Depression (spiritual stagnation) seemed to be my problem that could arise when the relationship with God was cut off. How can I get out of depression? I realized that I have something else deep in my mind that reminds me of a sense of failure and the emptiness in my life. So, in true repentance, the passage of Jesus Christ will break my state of the spiritual stagnation as I begin my prayer of gratitude, love, joy, and service. When we learn to be more grateful and worship genuinely, we will find that our personality could change, we will find true joy in loving and serving God. 2) Lord, lead me, and others out of the room of torment and into the room of blessing. 3) Thank you, Lord, who knows me. Thank you so much for your prayers and donation! In 2018, 한인여선교회 전국연합회에서 변화 프로젝트 교도소 문서 선교에 후원금을 총 $7,200를 보내 주셨습니다. 보내주신 선교헌금으로 문서를 통해서 열악한 환경에서 고통을 당하고 있는 많은 재소자들이 예수님을 만나게 도와주고 그들의 영적인 성장을 돕고 있습니다. 이번에 보내주신 선교헌금은 $5,200은 재소자들의 간증집 “Maximum Saints Books 1-3” 그리고 “Understanding Voices and Spiritual Warfare”책을 스페니쉬 책 출판하는데 사용되어질 것입니다. 주님의 복음을 전하고자 문서 선교를 위해서 봉사하시고 후원하시는 모든 여선교회 성도님들과 교회들에게 진심으로 감사를 전합니다. 미국은 다양한 나라에 민족들이 모여 사는 나라인 만큼 교도소 또한 여러나라 배경에 재소자들이 있습니다. 그렇기 때문에 영어로 된 책들 뿐만아니라, 스페인어를 비롯한 다른 나라 언어로 번역된 책들이 복음의 씨를 뿌리는데 절실히 필요합니다. 변화 프로젝트 문서 선교의 자원 봉사자들은 기도와 책 번역, 교정, 그리고 선교헌금등으로 사역을 후원해 주고 계십니다. 그리고 여러 나라 언어로 책을 출판하여 재소자들과 노숙자들에게 무료로 배포하고 있습니다. 변화 프로젝트 교도소 문서 선교의 2018년 현재까지의 선교 활동은 다음과 같습니다. 2. 스페인어책은 “치유, 사랑하는 사람들을 잃은 이들을 위하여” 2,000권이 출판되었습니다. 3. 한국어본은 두 권이 출판되었습니다: (1) “승리의 행진 2편: 교도소 영적 부흥과 문서 선교 회상록”; (2) “숨겨진 보배: 성령님”. 이 두 책을 엮어서 “선교의 꽃 10편, 미국 교도소의 영적 부흥과 성령의 역사” 2,000권이 한국에서 한인 재소자들을 위해서 출판되었습니다. 그리고 미국에서도 2,000권이 출판되었습니다. 4. 영어로 된 책은 4권이 출판되었습니다: (1) 2,000 권 출판한 “Understanding Voices and Spiritual Battles”; 은3 권의 책이 한권으로 합쳐져서 출판되었습니다: “Four Voices, How They Affect Our Minds; “The Long and Hard Road”; and “Tornadoes of Spiritual Warfare” (2) 2,000권의 “A Guide to Inner Healing” 이 출판되었습니다. (1) 스페인어로 번역된 재소자들의 간증책 3권을 엮어서 ”Maximum Saints Books 1-3”을 2,000권 출판하는데 $4,200.00의 재정이 채워지도록 기도하고 있습니다. 영어책은 많이 출판이 되었지만, 스페인어로 출판된 책은 몇 권밖에 남지 않아서 출판이 시급한 실정입니다. 더 많은 분들을 영적 서적으로 도우려고 계속 이 프로젝트를 추진하고 있습니다. (2) 세 분이 “선교의 꽃 11편: 내적치유 가이드” 의 한국어 번역을 도와 주셔서 이 책은 미국에서 2,000권이 출판이 됩니다. 이 프로젝트는 $5,000을 예산인데 $2,000의 선교헌금이 모아졌습니다. (3) 그리고 “선교의 꽃 11편: 내적치유 가이드” 2,000권을 한국에서 출판했하려고 준비하고 있습니다. 여기에 필요한 선교헌금은 이미 채워진 상태입니다. 주님께 감사와 찬양을 올려 드립니다. (1) 스페인어 “내적치유 가이드”의 번역이 거의 다 끝나가고 있습니다. 2,000권을 출판할 계획입니다. 여기에 필요한 선교헌금 역시 이미 채워졌습니다. 주님께 감사를 드립니다. (2) “예수님과 걷는 길 1-4편”이 중국어로 번역되고 있습니다. (3) 책 “소명”이 한국어로 번역되어서 마지막 편집을 하고 있습니다. (4) 책 “영적방해와 이해”는 한국어로 현재 번역 중에 있습니다. (5) 책 “Understanding Voices and Spiritual Warfare”이 스페인어로 번역이 되고 있습니다. (6) “Loving God Books 1-3” 영어 책을 2,000권을 출판하려고 준비하고 있습니다. $5,000 선교헌금이 필요합니다. (7) “선교의 꽃 8편, 평화를 찾은 사람들” 한국 책을 2,000권을 미국에서 출판하려고 준비하고 있습니다. $5,000 선교헌금이 필요합니다. 한국에선 이미 2,000권이 출판이 되었습니다. 앞으로도 계속 변화프로젝트의 문서 선교를 통해 복음이 땅끝까지 전해지기를 위해서 기도해 주시고 후원해 주시기를 부탁드립니다. 재소자들의 구원과 영적 성장을 위해서 수고해 주시고 후원을 아끼지 않으시는 분들에게 다시 한번 감사의 말씀을 드립니다. 열악한 환경에서 고통하고 있는 재소자들과 노숙자들에게 복음의 씨를 뿌리시고자 우리를 부르시고 동참하도록 인도하신 주님께 모든 영광을 돌립니다. 주님의 은총이 함께 하시길 기도합니다. Greetings, in the name of our Lord, Jesus. 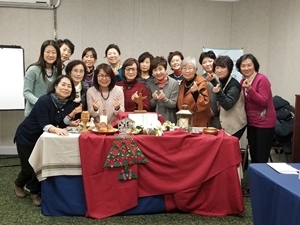 National Network of Korean American United Methodist Women donated a total of $7,200 in 2018. You are helping many prisoners to find Christ and grow in faith in their most difficult and times. In 2018, NNKUMW donated to TPPM a total $7,200. You helped many prisoners to find Christ and grow in faith. The recent donation you sent $5,200, we will be printing inmates stories, “Maximum Saints Books 1-3” and 2,000 copies of “Understanding Voices and Spiritual Warfare” in Spanish. Thank you so much for your generous donation. There are people of many nationalities incarcerated in American prisons. To share the message of the gospel of Jesus Christ, we not only need English and Spanish books but books written in many different languages. and homeless people in many languages free of charge. (1) “Journey With Jesus 1-4” This book has four books combined. 2. 2,000 copies of “Dancing in the Sky, A Story of Hope for Grieving Hearts” were published in Spanish. (2) “Invisible Counselor”. 2,000 copies of “Blossoms Volume 10” were published in Korea and another 2,000 copies in the United States. (2) 2,000 copies of “A Guide to Inner Healing” were published. (3) 2,000 copies of “Maximum Saints Books 1-3”, which has three books combined: “Maximum Saints Never Hide in the Dark”; “Maximum Saints make No Little Plans” and “Maximum Saints Dream”. (1) Currently, we are working to raise $4,200 to publish 2,000 copies of the "Maximum Saints Books 1-3" in Spanish. This book combines three books in one. Each book contains powerful testimonies from inmates, and many of these books have been published in English. We are publishing these in Spanish because there are only a few Spanish copies remaining. (2) Three people helped translate “Blossoms Volume 11: A Guide to Inner Healing” in Korean and we are ready to publish 2,000 copies. We are raising $5,000 for this project and $2,000 has been donated for this project so far. (3) We are preparing to publish 2,000 copies of the Korean book "Blossoms Volume 11: A Guide to Inner Healing" in South Korea. The funding for this project is donated. Praise God! (1) The translation of the “A Guide to Inner Healing” is almost finished in Spanish and is being edited. We plan to print 2,000 copies. The funding for this project is donated. God is truly amazing! (2) “Journey With Jesus 1-4 "is being translated into Chinese. (3) “Callings" is being translated in Korean, and we are completing the final editing. (5) “Understanding Voices and Spiritual Warfare” book is being translated into Spanish. This book has three books combined. (6) “Loving God books 1-3” English book is being edited to print 2,000 copies. We are raising $5,000 for this project. (7) “Blossoms Volume 8, Finding Peace” Korean book is getting ready to print 2,000 copies in the United States. We are raising $5,000 for this project. I ask you to continue to pray for TPPM so we can spread of the Gospel to the ends of the earth through these books. Thank you once again for your hard work and support for the TPPM Ministry for the salvation and spiritual growth of prisoners. I give all the glory to our Lord, Jesus Christ, for giving us the opportunity to work together to reach out to the suffering prisoners and the homeless and plant the seed of hope in Christ through this book project. 최근 세기의 이혼소식으로 미국 뿐만 아니라 세계를 놀라게 한 아마존의 최고 경영자 제프 베이조스, 이혼에 따른 재산 분할에 초미의 관심이 쏠리면서 그가 가진 재산의 규모 1500억 달러($150Billin)라는 가늠조차 할 수 없는 개인의 소유에 많은 이들은 상대적 박탈감에 빠진 것이 사실이다. 인류가 생긴 이후로 최고의 재산을 소유하고 있다는 아마존의 최고 경영자 제프 베이조스는 1분마다 23만달러($230,000) 를 벌며, 이 액수는 미국의 1인 근로자가 버는 1년 평균 수익의 4배의 가치에 해당한다. 어떻게 이토록 많은 재산이 한 사람에게 편중될 수 있을까? 불행하게도 이 소득과 부의 불평등은 지금도 그리고 이후에도 그 격차가 더 커지게 될 것임은 자명한 사실이다. 상위 1%에 해당하는 특권 계층은 정책 입안 및 입안자들에게 접근력이 더 크고 이 접근력과 친밀감은 그들에게 유리한 시스템을 조작할 수 있게 하여 소득 불평등은 더 커져만 갈 것이다. 부는 더 많은 부를 가져다 주고 가난은 대물림 되어 빈부의 격차는 더 커지는 불합리한 사회가 오늘이고 내일이며 미래라면 당신은 어떻게 그리스도인으로서의 정의를 세상에 외칠 것인가? 미국은 최근 수십 년 동안 소득과 부를 집중적으로 변화시켜 대다수인의 삶이 더 고단해졌다. 상위 35%의 실질 소득은 지난 35년간 185% 증가했지만 나머지 65% 인구의 소득은 평균 13% 증가에 그쳤다. 오른 물가에 비하면 13%에 그친 소득 증가는 삶의 질이 마이너스라는 것을 반대로 의미하는 수치이기도 하다. 매사추세츠 공과대학의 생활 임금 계산기에 따르면 한 성인의 생활 임금은 음식, 주택, 교통, 육아, 의료비용 및 세금 등을 고려한 시간당 $16.41 이다. 2019년 현재 미국의 최저 임금은 시간당 $7.25이며 그중 캘리포니아는 $11, 플로리다는 $8.46에 그친다. 경제적 불평등은 특히 여성에게 더 극명하게 나타나는데 이는 여성이 전체 저임금 근로자의 75%에 달하기 때문이다. 너무나 많은 일자리가 최저 임금을 지불하고 있는데 여성들이 이 최전선에 놓여있다. 최저 임금과 생활 임금 간의 큰 격차는 바로 여성의 문제이다. 연합감리교여선교회는 공정하고 정당한 정책 변화로 인해 소득과 부의 격차를 줄이는 것에 힘을 쏟고있다. 임금은 가족의 문제이기도 하다. 가족, 결혼, 그리고 자녀를 충족시켜야 하는 양육에 대한 부담을 상상해보자. 저임금 근로자의 수는 지난 25년간 꾸준히 증가해 왔다. 많은 경우가 휴가, 휴일, 병가, 건강관리 또는 기타 혜택을 지급하지 않는다. 최저임금 인상은 가족을 강화시킨다. 연합감리교여선교회는, 여성 그리고 청소년 및 아동들에게 미칠 경제 정책에 적극 참여하기를 권고한다. ‘ Women Living Wage Map ’에 방문하여 현재 거주 중인 지역의 임금 인상을 위해 일하는 법안과 단체에 대해 알아보고 참여할 수 있는 방법을 모색해 보자. 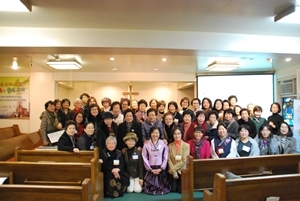 연합감리교회 여성 경제 불평등 웹페이지(Unitedmethodistwomen.org/economic-inequality) 에 자료를 신청하고, 임금문제 개선을 위해 일하고 있는 지역의 사회 단체의 활동에 참여하여 주님의 부름에 답해보자. 경제적 불평등에 가장 큰 영향을 받고 있는 사람들의 필요에 귀 기울이고 그들의 목소리를 증폭하는 데 선한 영향력을 발휘하자. 연합감리교 여선교인으로서의 깊은 연대가 여성과 가족의 번영을 도울 수 있다. 예수님은 이사야서에 나오는 이 말씀으로 공적인 사역을 시작하셨다. “주의 성령이 내게 임하셨으니 이는 가난한 자에게 복음을 전하게 하시려고 내게 기름을 부으시고 나를 보내사 포로된 자에게 자유를, 눈먼자에게 다시 보게 함을 전파하며 눌린자를 자유롭게 하고 주의 은혜의 해를 전파하게 하려하심이라 하였더라” (누가복음 4장18,19절) 그리스도인으로서의 믿음은 사회적이고 영적인 행복을 위한 행동을 필요로한다. 특히 가난한 자와 억압받는 자들을 돌보는 것은 주님이 우리에게 주신 사명이다. 모든 사람이 자신이 가진 모든 것을 나누고 과부와 고아를 돌봤던 초대교회인들의 모습을 우리 자신의 모습에 투영해봐야 할 시점이다. 탐욕과 경제적 착취 그리고 가난한 사람들의 필요에 무관심한 경제적 체계가 하나님의 뜻에 어긋난다는 선지자들의 경고는 우리에게 어떤 물음으로 되돌아오는가? 주님은 오늘 우리에게 어떤 삶의 태도를 원하실까? 형평성, 존엄성, 지속할 수 있는 생계 및 경제적 안정을 추구하기 위해 노력하는 ‘자비와 공의’ 에 자리를 함께하기를 원하시는 주님의 선한 초대에 응하자. Recently, attention has been focused on the divorce news of the century by Amazon's CEO Jeff Bezos, who surprised not only the US but the world. It is true that many people have been deprived of his immense personal wealth of $ 150 billion that people have learned because of the division of property due to the divorce. Amazon's chief executive Jeff Bezos, who owns the most property ever since mankind, earns $ 230,000 a minute, which is four times the average annual earnings earned by one person in the US. How can wealth be concentrated on one person? Unfortunately, this income and inequality of wealth will become even wider now and in the future. 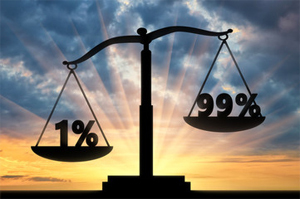 The top 1% of the privileged will have greater access to policymakers and planners, and this access and closeness will allow them to manipulate systems favorable to them, leading to greater income inequality. How will you cry out to justice as a Christian if the wealth brings more wealth and the passing down of poverty is causing widening gap between the rich and the poor and that this is the society of today and tomorrow and the future? In recent decades, the United States has focused more on income and wealth, and the lives of most people have become tougher. The real income of the top 35% has increased by 185% over the last 35 years, but the income of the remaining 65% has only increased by an average of 13%. Compared to inflation, an increase of 13 percent in income means a lower quality of life. According to the Massachusetts Institute of Technology 's living wage calculator, an adult' s living wage is $ 16.41 per hour, taking into account food, housing, transportation, childcare, medical care, and taxes. As of 2019, the minimum wage in the United States is $ 7.25 per hour, of which California $ 11 and Florida $ 8.46. Economic inequalities are particularly pronounced for women because they account for 75% of all low-wage workers. Too many jobs are paying the minimum wage, and women are at the forefront. The great gap between minimum wage and living wage is the problem of women. The United Methodist Women's Mission is committed to reducing the gap between income and wealth due to fair and just policy changes. Wage is also a matter of the family. Imagine the burden of family, marriage, and parenting that must meet your child’s needs. The number of low-paid workers has steadily increased over the last 25 years. Many do not pay for paid vacations, holidays, sick leave, health care or other benefits. The minimum wage increase strengthens the family. Wage inequality also links racial and immigrant rights issues. Colored people are more focused on low wage jobs. Half of the minimum wage labor is colored, and this transfer can be passed on to their second generations, which can result in weakening the ability to save and own wealth. The United Methodist Mission is also listening to racial discrimination on the back of a vulnerable structure in which children of minimum-wage workers can not attend school or seek better jobs. The United Methodist Social Principles affirm, "We support measures that would reduce the concentration of wealth in the hands of a few." (Social Principles, The Book of Discipline of The United Methodist Church, 2008, p. 163). The United Methodist Women's Mission recommends that you actively participate in economic policies that will affect women, youth, and children. Visit the 'Women Living Wage Map' to find out about the legislation and organizations that are working to raise wages in your area. Apply to the United Methodist Women's Economic Inequality web page (UnitedMethodistwomen.org/economic-inequality) and participate in the activities of a local social organization working to improve wage problems to answer your call from the Lord. Listen to the needs of those who are most affected by economic inequalities and have good influence in boosting their voices. The deep solidarity as a United Methodist church member can help women and families prosper. Jesus began public ministry with this statement in Isaiah. "The Spirit of the Lord is on me, because he has anointed me to preach god news to the poor. He has sent me to proclaim freedom for the prisoners and recovery of sight for the blind, to release the oppressed, to proclaim the year of the Lord’s favor. "(Luke 4: 18,19) Faith as a Christian requires action for social and spiritual happiness. In particular, caring for the poor and the oppressed is a mission the Lord has given us. It is time for everyone to share everything they have and project the images of the early church members who have taken care of widows and orphans in our own image. How does the warning of prophets come to us that greed, economic exploitation, and an economic system indifferent to the needs of the poor are contrary to God's will? What does the Lord want us to do today? Let's meet the Lord's good invitation to join us in our "mercy and justice" efforts to pursue equity, dignity, sustainable livelihood and economic stability.